The updated kitchen, with granite countertops, all white cabinetry, and newer appliances leads to the spacious dining and living area. Here you can enjoy comfortable seating, large flat screened television, and access to the balcony where you can enjoy fabulous Florida sunsets while enjoying your favorite beverage! The master bedroom is nicely decorated with one queen sized bed, with access to the balcony and its stunning views. The second guest room also offers two twin sized beds, plenty of closet and dresser drawer space. Washer and dryer, three televisions, free WIFI and long distance are also included. Kitchen utilities, linens, extra towels and pillows are provided for the comfort of our guests. One big attraction to this popular unit is its premier location to not only the beaches, heated swimming pool, and BBQ facilities, but also it is just across the street from John's Pass Village, a highly regarded and talked about destination for tourists and year round residents alike. The Pass is a quaint turn-of-the-century fishing village and Pinellas County's number 1 tourist attraction. The Village has over one hundred unique shops, a variety of restaurants, the local fishing fleet, dolphin watching and shelling tours, boat rentals, parasailing and jet skiing. Best of all as a SunHost customer you can walk to this great entertainment destination. Anchor tenants include Bubba Gumps, Hooters and Hubbards Marina and also world famous Bamboo Beer Garden. 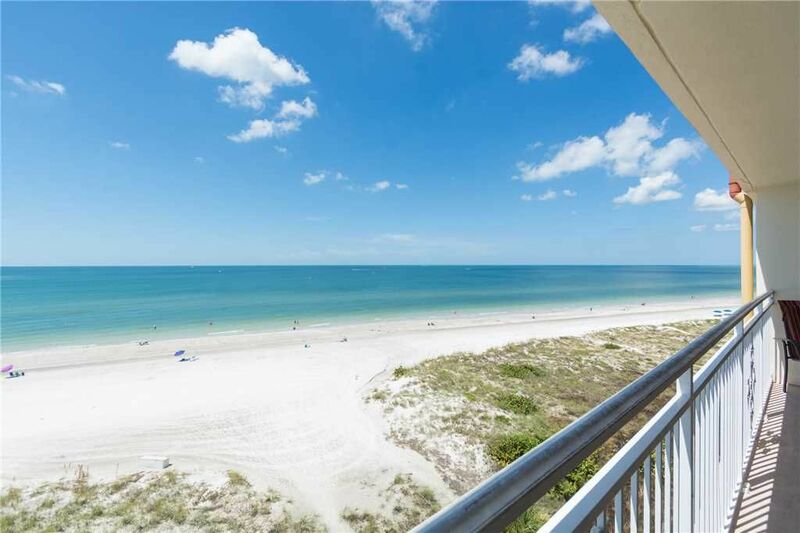 Had a great time,condo was great,very busy beach at all times,had to get up by 8 to save my spot.good location even though was near Johns pass not a problem ever. Treated like it was my own and left it the same..thanks for another great time. Beautiful condo that is nicely decorated in a great location. The beach front is beautiful here. Directly across from Johns pass and all the shopping, food and entertainment you need. What a wonderful beachfront property! We hated to leave. My teenagers loved the boardwalk across the street, the view from the balcony was perfect. The condo is very up to date and clean! Had all the necessities for a great vacay! It has a nice blender, good coffee maker, all appliances work great! The kids were very comfortable and it’s just a great space to relax! We met super nice people at the pool. The beach access is easy peasy. The amount of manatee and dolphins we saw while swimming was unbelievable! Great great great vacation spot! Highly recommend jet skiing and the snorkel/dolphin chasing boat ride! Also Gators which is over the bridge has fantastic food and music! We had an amazing vacation and the highlight was watching a beached dolphin being rescued and being sent back out to the ocean. That was amazing! The condo was great with just a couple of exceptions: The bed in the master bedroom is extremely uncomfortable and you can feel the dips in the mattress. Also the sheets had what appeared to be blood stains on them. We ended up purchasing our own sheets to use. I am not sure who the cleaning/laundry staff are but they should never put blood stained sheets on the bed. Having said that it was an easy fix for us and we didn't let it bother us. Everything else we needed was in the condo. We had a wonderful week. The condo has such great views, close to everything! Condo clean and had everything we needed. Would love to stay there again! !